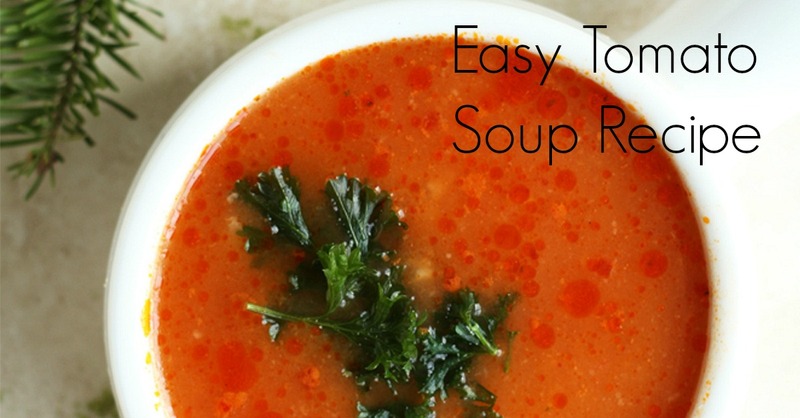 Today’s easy tomato soup recipe is courtesy of our contributor Ilona from Ilona’s Passion. Unfortunately this is the last recipe we will see from Ilona on the blog, but she will still be posting her delicious recipes at Ilona’s Passion, so make sure you head over to check what awesome recipes she has to share. Hi! This is Ilona and today I have a very quick and easy recipe. 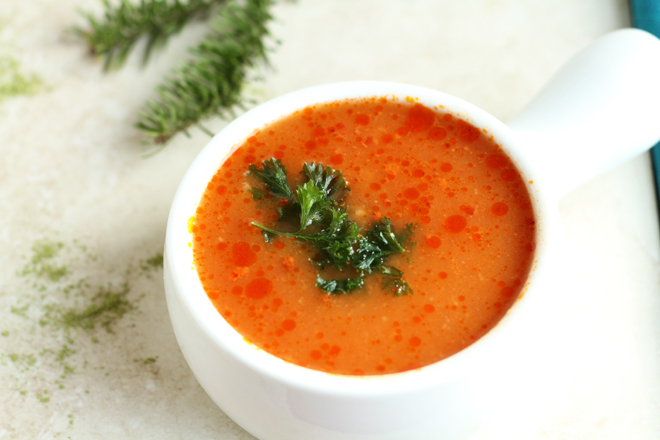 This tomato soup is made with only a few ingredients. 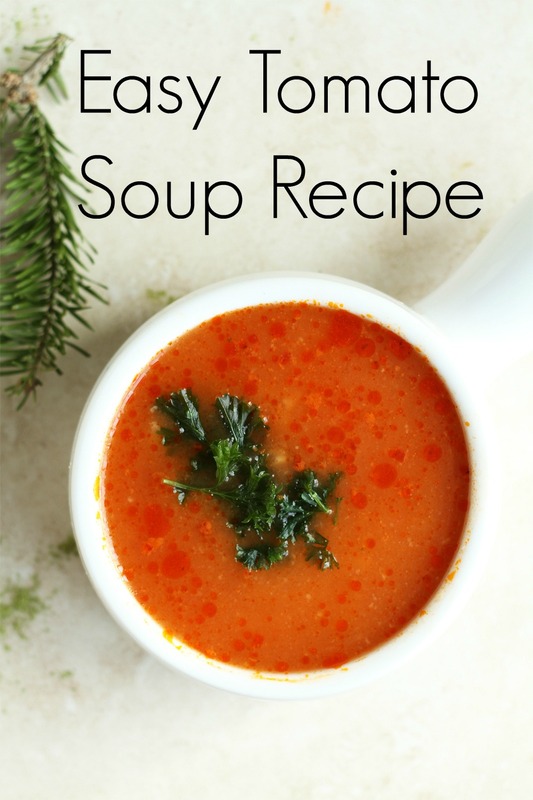 It’s perfect for winter months or any time of the year. I cook soups often at my home which are healthy and full of vegetables. 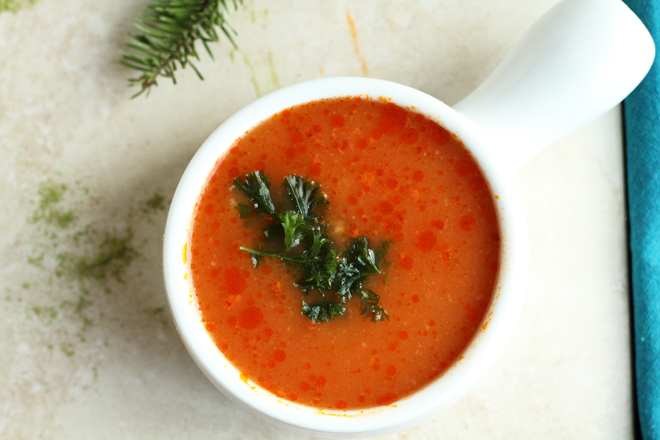 These soups are also very comforting for the cold months. However, sometimes I don’t have the time to cut all the vegetables and cook the soup for a few hours. 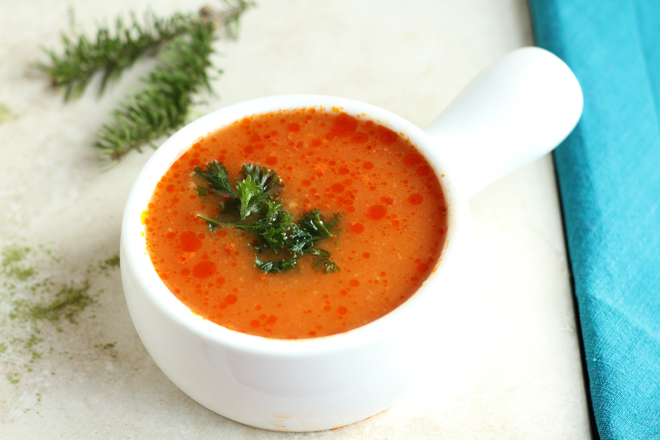 When I have a busy day I always make this tomato soup because it’s so quick. It will probably take no more than 30 minutes. My older son likes to have a warm meal at school instead of a sandwich and this is when I cook this quick soup for him. I actually did it yesterday evening and this morning I just warmed it up……and voila!. A hot lunch is made so quickly. This soup can be served with pasta, bread or rice. We mostly eat with rice. Tomato + Rice is a great combo. Try it and you”ll definitely like it. I also made it without chicken stock, and just used plain water. However, if you have a chicken stock on hand you can use it because the soup will be more flavourful. Instead of a chicken stock I used a bouillon cube. I found organic cubes at the health store the other day and I already like them. I will be buying more of them, so I can make my soups fast. If you are looking for more quick and easy recipes check Baked Parmesan Zucchini Bites, Easy Feta Apple Salad and Easy Zucchini Kale Pasta. All of them are very tasty and require only few ingredients. Also, they are made in less than 40 minutes! In a medium saucepan bring water to boil. Add bouillon and dissolve completely. In a frying pan melt butter and add tomato paste. Cook on low heat for 5 minutes. Mix all the time. Add the tomato paste to the water. Cook on medium heat for 20 minutes. Serve with pasta, rice or bread. Can’t believe how easy this is to make – but it also sounds so great. Good styling on the photographs too 🙂 Thank you for sharing at Welcome Home Wednesday, we’ll miss you Ilona! My son loves taking warm things in his thermos too. I’ll have to make him this when we get all of the rain that’s been promised next month. Thanks for sharing on the Creative K. Kids Tasty Tuesdays Linky Party. We hope you will join us next week. Who knew it was such an easy recipe! No more cans for me! Thanks for linking up to Merry Monday! Sharing on Twitter! Have a great week! You will never go back to canned tomato soup after you have tasted this Kim 🙂 Thanks for sharing!